The flames move uncontrolled toward the core zone, destroying thousands of hectares. 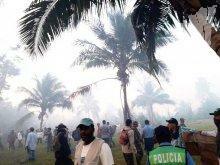 An important fire is damaging the Indio Maiz Biological Reserve located in the Nicaraguan South-Est corner. The fire started last Tuesday (April 3) in the afternoon, in a small rural community less than 2 miles (3 km) South from San Juan del Norte town. And now have move West, heading to the core zone of the reserve, and devastating approximately 2.6 thousand hectares (10 square miles) of jungle until today’s morning. Several howler monkey bodies remains motionless and burn, still holding on the blackened branches of a tall tree which persist standing in the middle of a smoldering landscape. This scene was observed yesterday by a group of local volunteers participating in the monitoring task undertaken by the local government in San Juan del Norte municipality, also know as San Juan de Nicaragua. ViaNica could talk with those volunteers to have an approach on the fire situation. But they asked to remain as anonymous source of information, as the local authorities have not the Central Government permission to give official information. The fire started on April 3 afternoon in the Siempre Viva community, located in the rio Indio riverside. A man from the community traveled the 3 kilometer from there to the San Juan del Norte center-town, and alerted the authorities. A commission was sent, but the officials could not control the fire. The night fell, and they decided to return next morning better prepared. Since the early morning of yesterday, Wednesday April 4, a 150 to 160 people commission came to the fire site, organized under the local system for disaster prevention and attention (which involve the local government, police, civilian volunteers, the army and more). 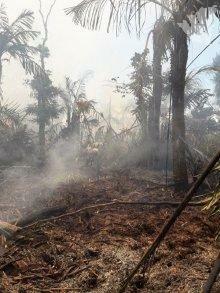 Until then, the fire had destroyed around 10 hectares of jungle and pastures. The people was divided in groups to attack the fire. The main goal was to prevent the fire advance to the San Juan del Norte town. But the wind carried the flames onto the West, inside the natural reserve, far from the town. 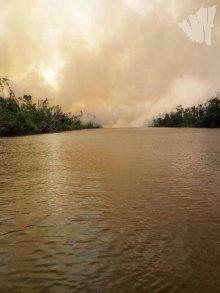 Unfortunately, the fire surpassed several river and get uncontrollable while heading to the El Castillo municipality. The people in the commission fought the fire with buckets and other rudimentary tools, and were unable to stop the flames. Today the fire continue uncontrolled and is approaching the core zone of the Indio – Maiz biological reserve. Several small, rural communities are also in danger, as the fire advance to the río San Juan riverside. Thea nearest communities in this way are El Jobo, El Delta and Zapotal, where around 95 families live. The jungle destruction caused by the fire is extensive. The area currently affected had several natural elements that are fuel for the flames, as many native royal palm trees, and a lot of fallen trees after the Otto hurricane pass on November 2016.